Beware of interfaith groups, ministers, chaplains and churches. Satan is infiltrating churches today with generic interfaith groups that are intended to lead people away from the truth of God's Word. In our text Verse we find the prophet Elijah asking the people how much longer they were going to halt between two opinions. The people were speechless. That pretty much describes America's churches today... indifferent, confused and speechless! We often hear about an End Time World Religion; but actually, the existing religions will remain, adapting to an ecumenical commonality and unity. In this shared union, the sin of homosexuality is allowed and tolerated. Already we see this wickedness becoming prevalent in society's churches. The primary reason why homosexuality is thriving today is because of a woeful lack of Bible-preaching in America. The greatest need of the hour is preaching preachers!!! Multitudes of people are following religion without having the truth. Most people today have churchianity without Christianity. Interfaith chaplains. ministers and churches are becoming very popular in the apostate world today. 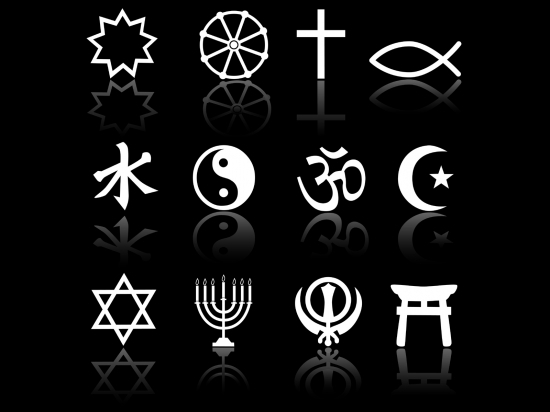 Most interfaith groups are composed of Modernists (an unsaved person who thinks they are saved). Rev. John R. Mabry, Ph.D., he denies Christ's deity, denies the virgin birth and teaches that the Apostle Paul was a fictional character. This is a professed minister, reverend and Christian teaching this garbage..
"Jesus said, 'No prophet is welcome on his home turf; doctors don't cure those who know them.' This was certainly true in Jesus' own time-his teachings did not enjoy widespread success in Israel. And it is true today: though the Gospel of Thomas was discovered in a cave in Egypt over fifty years ago now, the church has taken little notice of what scholars agree is the most reliable source of his original teaching. This is not surprising, since the Jesus of Thomas often stands in direct opposition with the fictional Jesus of Paul. "Whenever I discover that a new acquaintance is Jewish, I have taken to asking whether they meditate. They are often surprised, and frequently admit to it. 'I'm Jewish, but I practice Buddhism,' many of them tell me-although I do live in California, it seems like this is true for well over half of the people I ask! The film 'The Jew in the Lotus' revealed that a startling 30% of Buddhists practicing today are Jews by birth. If this is accurate then approximately 600,000 of the 2 million practicing Buddhists in the US today are Jewish (1998 Britannica Book of the Year). This rise of 'Jubus' in our culture is nothing short of a phenomenon, and most who have one foot in both religious camps see little or no conflict between them." Who would have thought that so many Jews would embrace Buddhism? Though Christians seem to be missing the boat, the rediscovery of the Thomas school presents a unique opportunity for Jews. For it is within their power to reclaim one of the Jewish tradition's greatest rabbis as their own. And for Jews who follow the Buddhist path there is another, even more startling revelation: a two-thousand year-old tradition marrying Jewish observance with Buddhist insight." "In the Thomas gospel, Jesus is presented as a spiritual guide whose words (when properly understood) bring eternal life (Saying 1). Readers of these sayings are advised to continue seeking until they find what will enable them to become rulers of their own lives (Saying 2)"
The Gospel of Thomas says Jesus died, but no mention is made of Christ's resurrection, nor of Jesus being crucified. My friend, there is NO Gospel without the death, burial and resurrection of our Lord Jesus Christ (1st Corinthians 15:1-4). Take for example, The Chaplaincy Institute. There is no mention of the Gospel anywhere on their website. You could be an unsaved Seventh Day Adventist, Church of Christ, Lutheran, Catholic or a Mormon and you'd never be offended. These are wolves in sheep's clothing. "When I was about 10, I started going to the First Baptist Church with a friend’s family. Here I began to learn that religion was not as simple as memorizing Bible verses or singing a song. I found out that I was a sinner, and that God sacrificed His only Son to die on the cross to save me from an eternity in hell. I accepted Jesus into my heart and prayed nightly that my sins would be forgiven and that I might be worthy to enter the gates of heaven. I learned that it was also necessary to be baptized, so I did that too. I wanted to do everything right to guarantee my spot at Jesus’ feet." WHAT A HERETIC!!! I seriously doubt if a First Baptist Church minister told her that water baptism is required for salvation. Water baptism is NOT mandatory for salvation. My friend, you don't have to do everything right to be saved; Jesus did everything right for you. Just trust Him and what He did to pay for your sins at Calvary when He died, was buried and rose up from the dead three days later. Also, you don't have to pray nightly to have your sins forgiven to get to Heaven. She speaks of salvation as if it were a process, like Seventh Day Adventists and Muslims errantly do. Salvation is a new birth by the Spirit of God—a second, spiritual birth—a miracle of God in response to one's faith in the Gospel (i.e., the death, burial and resurrection of Jesus Christ, 1st Corinthians 15:1-4). Jesus said, “Ye must be born again” (John 3:7). This article by Betty Light is terrifying, because it shows how easily Satan can deceive people into going to Hell forever. Notice that Betty thinks she must pray nightly as part of being “worthy” to enter into Heaven's gates. My friend, no one is worthy to enter into Heaven's gates. Revelation 5:4, “And I wept much, because no man was found worthy to open and to read the book, neither to look thereon.” Ah, but Jesus is the worthy Lamb of God Who paid for our sins with His own precious blood. Revelation 5:9, “And they sung a new song, saying, Thou art worthy to take the book, and to open the seals thereof: for thou wast slain, and hast redeemed us to God by thy blood out of every kindred, and tongue, and people, and nation.” Amen! Whew! Betty is correct that we are all sinners and God sacrificed His only begotten Son for our sins; but Betty is very wrong about adding prayer to be saved—she is very wrong to add water baptism to be saved—she is also very wrong about trying to become worthy to be saved—and she is very wrong about having to ask Jesus into your heart to be saved—and finally, she is very wrong in her thinking that salvation is a relationship with Jesus Christ. There are many false gospels circulating in churches today. Seeking a growing relationship with Jesus is NOT salvation. Making a commitment to Christ is not salvation. Asking Jesus into one's heart is not salvation. Turning over a new leaf, forsaking the world, surrendering all to Jesus, living for the Lord from now on, faith alone in Jesus alone—these are all false gospels. That's the Gospel: Jesus' DEATH, BURIAL and RESURRECTION. If you receive Christ's death, burial and resurrection as payment for your sins, you are saved instantly, immediately and eternally. All women preachers are false prophets. The Bible teaches that Eve was deceived, and therefore women should teach men. The Biblical implication is clearly that women are more vulnerable to false doctrines and deception than men. 1st Timothy 2:12-14, “But I suffer not a woman to teach, nor to usurp authority over the man, but to be in silence. For Adam was first formed, then Eve. And Adam was not deceived, but the woman being deceived was in the transgression.” Women belong at home baking cookies and pies, not teaching heresy or policing men. The sad fact of the matter is that women preachers and apostasy in America's churches are directly proportional. Women preachers are closely related with feminist theology and lesbianism in our churches. Gated communities are becoming popular because of the rising crime rate in America. Many of these communities have an interfaith chaplain on duty fulltime. This man or woman is available for weddings, funerals, marital or family counseling and hospital visitation. It's disturbing that our nation's churches are dying and interfaith chaplains and ministries are becoming increasingly popular. Even worse, they don't even know how to be saved. Rev. Betty Light (as she calls herself) is as confused about salvation as most religious people are. It's sad and tragic that a chaplain who claims to have the ability to help others doesn't even have salvation correct. I didn't author this article to be unkind, sincerely. I wrote this article to warn others about the increasing trend of interfaith ministers, chaplains, groups and churches these days—which teach a false plan of salvation, embrace homosexuality and lead people into apostasy and ecumenism. Elijah asked the Israelites how much longer they were going to remain neutral, stuck between two opposing opinions? My friend, if that's not interfaith apostasy I don't know what is! The people didn't know if they should follow the 400 prophets of Baal (Jezebel's ministers), or Elijah (God's prophet). Read the following Scripture concerning the evils of women preachers. Revelation 2:20, “Notwithstanding I have a few things against thee, because thou sufferest that woman Jezebel, which calleth herself a prophetess, to teach and to seduce my servants to commit fornication, and to eat things sacrificed unto idols.” Lo and behold, Rev. Betty Light has authored an article title, “Icons In Orthodox Christianity,” which attempts to legitimize the use of images (idols) in worship of God. This is exactly what God was upset about in Revelation 2:20, IDOLS..
Icons are to be used as an aid to worship and to be placed in an area of prayer. Jim Forest, in his book, Praying with Icons (2) quotes Father Zinon an icon painter and monk of the Monastery of the Caves, near Pskov, Russia: "They are a reflection that God became man. They are holy doors. To make an icon is the fulfillment of prayer. One feels the Holy Spirit as they work."" The word “idol” in the New Testament (such as 1st Corinthians 8:4) is the Greek word eidolon and means “an image (that is, for worship).” Betty Light is dangerously close to idolatry, if not altogether so. There's nothing taught in the Bible about using icons, images or idols during prayer and worship of God. Betty Light says icons aid in worship, calling them “holy doors.” The Bible doesn't teach these strange doctrines. In these times of woeful apostasy and open rejection of the truth, people are not willing to endure sound doctrine that steps on their toes. 2nd Timothy 4:3 foretold that such apostates would seek out weak-kneed teachers, saying what the audience wants to hear. Why Young People Are Abandoning Evangelical Churches. Romans 10:17 says faith cometh by hearing and hearing by the Word of God. This truth goes for children and adults alike. Oh, how we all need to hear the Words of God. Preachers more than anything else today need to preach the simplicity of the Gospel of the Lord Jesus Christ (2nd Corinthians 11:3-4). We don't have to simplify the Gospel for it is already greatly simplified for anyone believes it. The Gospel doesn't need our eloquent speech, nor our multiple talents, nor our coveted abilities, nor our great wisdom. No, rather, the Gospel needs our smelly feet. This is why in Romans 10:15, God calls the believer's feet “beautiful,” because it is with our smelly feet that we bring the Gospel to lost sinners. Even the most eloquent words of wisdom mean nothing if our feet do not take the Gospel to the lost to evangelize them. The most important part (and the hardest part for most people) of The Great Commission given by our Lord is “GO YE!” Most Christians never get passed this crucial part of sharing the Gospel with others. Jesus confronted the Samaritan woman at the well about her salvation. She got saved. Jesus didn't wait for her to come to find Him. The Bible teaches Confrontational Soul-Winning, not Life-style Evangelism. Life-style Evangelism is the false teaching that we should live in such a way that the sinful world will beg for what we have. Such cases are rare. If you ask people who are saved how they got saved, most of them will tell you that another Christian witnessed to them. Soul-Winning is not a method, it is a command by God (Let's Go Soul Winning By Dr. Jack Hyles). If the wealthy, arrogantly proud and those too busy won't receive Jesus said to compel them to come in, going out into the highways and hedges with the Gospel, that the Father's house may be full. ... the needy, lost sinners, the poor, mentally challenged, brokenhearted and disabled, et cetera. Rich people have their retirement all figured out, but God is not included. Thou fool! Behold, this night shall thy soul be required of thee. Proverbs 27:1 says, “Boast not thyself of to morrow, for thou knowest not what a day may bring forth.” We're just flesh covered skeletons, given the spirit of life by God (Ecclesiastes 12:7). The life of the flesh is the blood (Leviticus 17:11). I love all my web visitors in the Lord and my heart's desire is to help others find the Gospel, the true Gospel that saves men's souls. Forget water baptism, that's just a bath you're getting. Forget the praying. Judas kissed Jesus, even called Him “friend,“ yet he went straight to Hell after hanging himself in grief for betraying the Son of God. Judas could have been forgiven, but he didn't personally trust upon Jesus as the Christ. Thousands of Jews wanting a handout followed Jesus all over the place. So following Christ is not salvation. "I accepted Jesus into my heart and prayed nightly that my sins would be forgiven and that I might be worthy to enter the gates of heaven. I learned that it was also necessary to be baptized, so I did that too. I wanted to do everything right to guarantee my spot at Jesus’ feet." Bible-believing Christians need to find out what God's opinions are on the issues by searching the Scriptures (John 5:39), and then we need to proclaim, teach, preach and share those opinions with the world, whether they like us or hate us doesn't matter. Jesus said they would hate us as Christians (John 15:19; 2nd Timothy 3:12). It's what God says that matters. We ought to seek God's praises (John 6:43). I love the Bible and listening to Alexander Scourby read the King James Bible on DVD is awesome. You can hear the entire Bible in about 75-hours. The Bible is so beautiful. I listened to 1st Kings, 2nd Kings, 1st Samuel and 2nd Samuel (all four books are sometimes referred to as the 4 Books of the Kings). I read about a heavy-set (fat) woman who helped God's man, Elisha. She suggested to her husband that they build Elisha a little guest room where he could stay when he was in town or just passing through. Elisha was so pleased that he asked what he could do for the dear woman. She was content and couldn't think of anything. So Elisha said, do you have a son, and she said, “no.” Elisha promised her and her husband a son. She said, “Please don't deceive me Elisha.” He replied and said, “I won't.” She laughed because she thought that she's too old and her husband also. But she conceived and brought forth a son. She was so happy. The child grew and one day injured his head and was holding his head. He ran to his father, but his father sent him to his mother. His mother panicked and sent for Elisha, but the boy had already died. Elisha came to his friend (the mama) and prayed unto the gracious Lord and the boy's life returned to him and the wound healed. I wept. Here's this dear saint of God who helps God's man, providing a place for him to lodge. Elisha blesses the woman with a son and he dies on her. She thinks it's over. She reminded Elisha that he said she would have a son. And so it was. The great thing that I see is God's goodness to this dear woman who is poor, but welcome's God's man into her home. It's a beautiful story in the Bible in 2nd Kings chapter 4. All throughout the Old Testament we see repeatedly, literally, hundreds of times where Israel does the wrong thing and forgets about God. But in every case where they cried out for mercy, whether one man or the whole nation, God had mercy and listened. It's so beautiful. You can grasp the feeling of what God expects from us as Christians. The Bible is so clearly written and makes so much sense when you listen to it as it was meant to be read. God just wants us to love and obey Him, and that means loving and looking out for our neighbors always. I'm telling you, I've never seen the Bible the way I do now after listening to it read from Genesis all the way through. The Old Testament plays through in about 50-hours. Just sit back, turn off everything (phone included), turn on a cozy lamp light, and set the volume comfortable, and just listen to the King James Bible by Alexander Scourby. It's something you will regret not having, I guarantee you. It's one of the greatest blessings in my life. I don't care for James Earl Jones (Darth Vader voice), but he also read through the King James Bible if you're interested. And there are others. Alexander Scourby was the first person to produce an audio Bible for the blind several decades ago.